Earlier this month, we covered the inclusion of "Play Protect" in a teardown of the latest Google Play Store APK. Today, Google formally announced this feature as part of its efforts to double-down on security. Boasting the fact that its machine learning algorithms scan over 50 billion apps each day, Google emphasized the importance of security on the Android platform. Before appearing in the Google Play Store, every app undergoes Google's security screening process which includes identifying malware and ensuring that apps conform to Google's policies. Play Protect continues that process by scanning billions of apps daily to make sure they remain safe and in compliance. 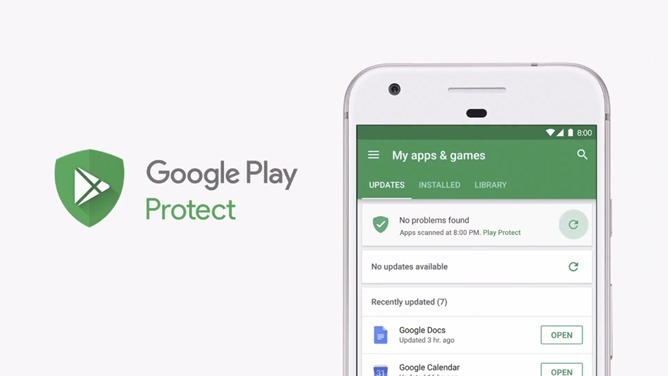 Play Protect's appearance in the Google Play app is Google's way of bringing its existing screening process to the foreground of your experience. Using the new Play Store, you will see when your apps were last scanned. Google says it works around the clock, constantly updating to keep up with the latest threats. Play Protect goes hand in hand with the safe browsing feature in Chrome and today's announcement of Find My Device. Google clearly wants its users to feel safe in knowing that it has an automatic process in place not only in the background but on your device as well. For all the details, follow the source links bellow.